In the publication FLIRT: fast local infrared thermogenetics for subcellular control of protein function (Hirsch SM. et al. Nature Methods 2018) , Hirsch and colleagues developed an innovative method to locally induce protein inactivation during live cell imaging: FLIRT (fast local infrared thermogenetics). This method takes advantage of fast-acting temperature sensitive mutations (ts) which conditionally inactivate proteins in a reversible way. While standard methods for ts protein inactivation have an effect on protein function at the cellular level, FLIRT allows to locally inactivate proteins at the subcellular level by means of an infrared (IR) laser targeted to specific locations. 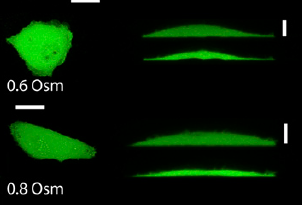 The authors used FLIRT in C. elegans embryos, to investigate the local effect of protein inactivation in real time in different molecular pathways. To fine tune local temperature changes through IR irradiation, a requirement for the method was that mounted embryos were kept at constant temperature. This was achieved using the CherryTemp temperature controller. Embryos were kept at 16°C for all experiments, while using IR for local temperature changes. 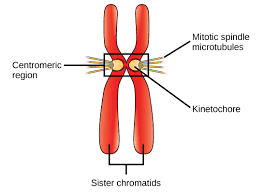 This ensured a homogeneous temperature across the embryo and reproducibility between embryos. These experiments show that the CherryTemp technology is not only a tool to perform ultra-fast temperature changes , but also to stably keep samples under ambient temperature (in this case 16°C), independently of room temperature and heat sink generated by immersion lenses. 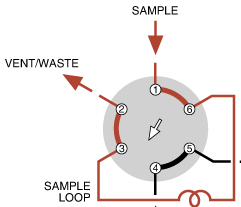 Figure: Schematic representation showing the mounting system used in Hirsch et al. 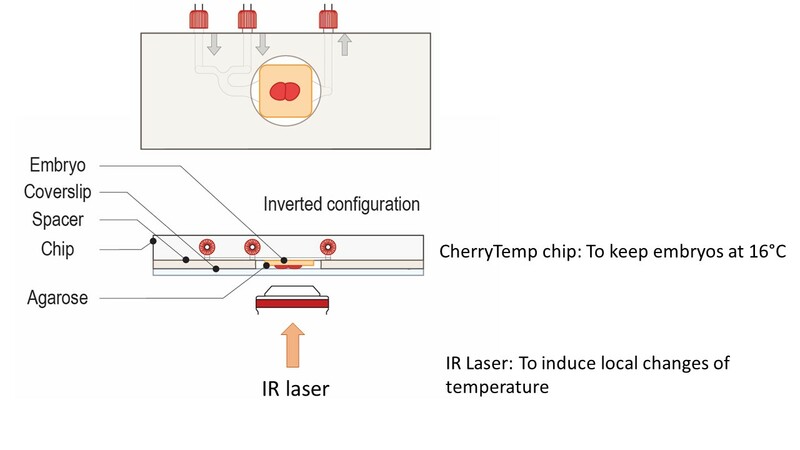 (Nature Methods 2018) to induce local temperature changes using IR laser coupled to temperature control using CherryTemp. 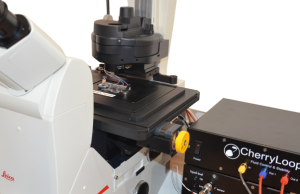 Summary| FLIRT (fast local infrared thermogenetics) is a microscopy-based technology to locally and reversibly manipulate protein function while simultaneously monitoring the effects in vivo. FLIRT locally inactivates fast-acting temperature-sensitive mutant proteins. 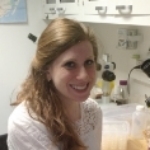 We demonstrate that FLIRT can control temperature-sensitive proteins required for cell division, Delta–Notch cell fate signaling, and germline structure in Caenorhabditis elegans with cell-specific and even subcellular precision.